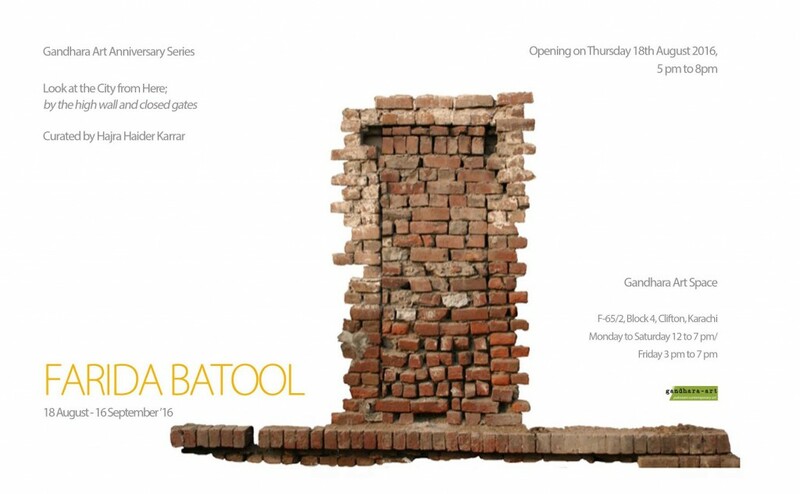 This exhibition is the third and last in the project series titled ‘Look at the City From Here’ curated by Hajra Haider Karrar, being shown in celebration of Gandhara Art’s 10th Anniversary. Look at the City from here is a discourse on artistic engagements embedded in the profound character of South Asian cities, grounded in shared histories, collective memories and diverse cultures. The artistic practice of the three artists featured in this series addresses different aspects of these influences on modern society. This series is a survey of each artist’s trajectory highlighting selected points in the artist’s oeuvre which binds it together. Farida Batool traverses the political urban landscape presenting contrasting realities through the dichotomy of before and after moments; the temporality of the present and the transformation of history and memory through erasure. By juxtaposing her experiences with those of others encountered along the way, she comments on the cultural and political turmoil of the present day. By using the lenticular technique as her medium of choice she creates these visible shifts in her narrative which allow the work to be navigated in multiple ways.